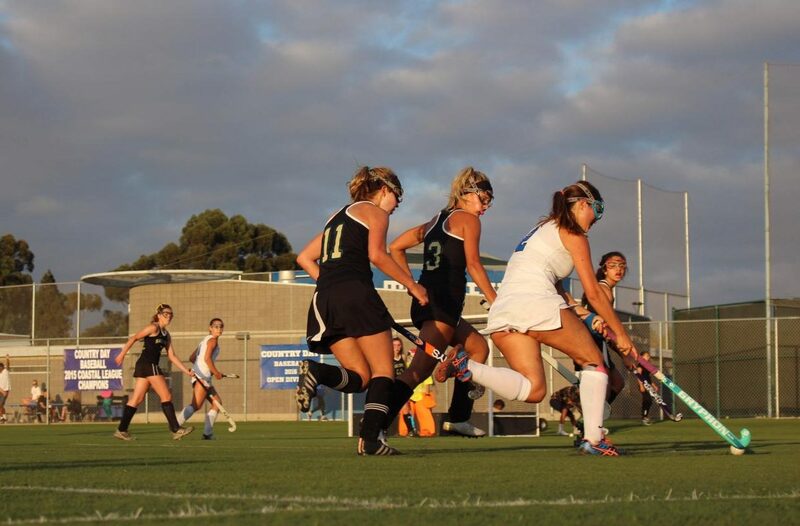 Sage Creek field hockey players defend La Jolla Country Day player. It is no secret that the girls field hockey team has gone through significant adaptations since the program began in 2013. Starting out as a brand new program with a brand new coach, the freshmen girls picked it up to kick off the fall sport season; although many of the girls who tried out that first year did not end up sticking with it, the program held strong in 2014 when a new group tried out. After two years of coaching and bringing awareness to the sport of field hockey, Analia Loevenguth had to step down as coach for her maternity leave, however, the girls were determined to keep the team alive that they recruited the track and field jumping coach, Jamal Brewer, to take over the position. Many had concerns as to how a coach who knew so little about field hockey would be able to pull off the task successfully. Brewer dedicated many hours of his time to studying and learning about every rule and tactic in order to turn the team into one that the girls, as well as new coach — believed they could be. As seniors in 2017, the same girls from 2014 are still pursuing their passion for field hockey, and many plan on furthering their involvement in the field hockey community by participating in club and college teams. One of those players, senior Chloe McGovern, has played field hockey since her freshman year and is a captain for the 2017 varsity team. McGovern commented on the devotion required for field hockey. On the off season, McGovern devotes her time to hone in on her technique by playing with a club team. “I started playing as a freshman and never did I think I would be attending the National Field Hockey festival or possibly play field hockey in college,” she affirmed. Another player, junior Sophia Parks, described her experience in how joining find hockey helped her learn more about herself. Parks also commented that because she chose to play a less common sport, she has learned a lot about teamwork, as well as how to appreciate being personally involved in a community where she watches a program build itself up day by day and coach by coach. Pertaining to the transition of head coaches in 2016, she mentioned that the drastic change was surprising. Someone who felt similarly to Parks and her outlook on being a member of the field hockey team is Taylor Riley. Riley revealed that when she met the new coach, “he was super understanding and [could tell] he was trying his best. He obviously played sports in high school […] so he knew team sports and it was super nice of him [to step up and coach us],” the junior admitted. Although Taylor had a different motive for joining the team, as her dad was actually the one who signed her up, she too grew passionate about the sport and learned to really love it for the physical aspect as well as social environment it comes with. Unfortunately, Riley admitted that in the beginning it was hard to persevere because she noticed that not many people went to the games, appreciated them, or even knew that Sage Creek had a girls field hockey team. “[Being apart of the field hockey team has] taught [ me] to persist and do what you love even if other people don’t enjoy it as much as you do, or if other people don’t understand,” Riley expressed. The junior has grown to sincerely appreciate the sport. “Just because not a lot of people come to our games, it doesn’t mean it’s not super fun or an enjoyable thing to do,” she said. The field hockey program plans to remain stable as of now, with a dedicated coach and dedicated group of girls; although, as made clear by multiple teammates, there is always room for new players. “Through field hockey I have learned that you are never too old to try something new,” Chloe McGovern exclaimed.